Ensure a firm, no-slip grip of your foods with this 7" utility tong! This tong features sturdy stainless steel handles with molded silicone tips that won't trap food particles and won't damage non-stick cookware. The silicone tips are heat-resistant up to 500 degrees, and their scalloped edges provide a firm grasp of your foods. These are the perfect serving size tongs! They fit great in our chafing dish & I love that they lock easily for storage. I will be buying more! I like how the tongs lock. Some tongs lock from the bottom, which is a hassle when putting them in the dishwasher, however this one has the nice locking slider. This is great and ensures the lock will not spring when being washed. I ordered several sets of these. They feel kind of cheap in my hand, but I'll be able to use them for lightweight duty for sure. These tongs are very sturdy and durable. They will be used at a wedding for chips and crackers. Perfect size for appetizers. The quality is very good. Great tongs if you are in need of something very small! We did not read the description well, because these are smaller then we expected. However, the quality is very good. These small tongs are excellent. The tension light so your hand won't get tired when using them. The silicone tip is pliable without being too stiff. I'm glad I ordered two of them. Time will tell how well they hold up to heavy usage. These are a nice little set of silicone tipped tongs. They're a little short for cooking unless you like getting your fingers right down in the pan, but perfect for dishing and serving afterwards. These are okay but the tips are flimsy and make it hard to grasp things like corn on the cob And anything heavy, could be used for salad or such though. These tongs have a great grip/locking system and I prefer to use the silicone tips so that my food doesn't break from the sharp corners on the regular stainless steel alternatives. These are awesome. I ordered 24 for HOME use. We use them for serving, cooking and anything else. My neighbors are constantly Higginbotham for buffets. Awesome product. Good springs and can be stored closed f or space saving. Great tongs used for plating or cooking smaller items. The locking mechanism on the end of the tongs can be removed with pliers if you don't want the self lock feature. Great tong! We use to make waffle cones and bowls and they've done a great job. The silicone tip helps on hot surfaces and doesn't scratch anything. These are really good silicone tongs. We especially love the silicone cover because it helps prevent scratching your pan's coating. This size is perfect for flipping eggs and omelettes. I am so happy to find this tong size at this website. I have been looking for this size for a long time. The quality is amazingly good. I really use these a lot in the kitchen, from serving appetizers to salads, to even using them for flipping things in Teflon coated pans, I ordered a few, but will be getting some more. Nice and tiny silicone tip tong will make you life in kitchen one step easier! It is really nice quality tong for a great price and it will also not scratch any surface! The 7" Silicone Locking Stainless Steel Utility Tong is highly durable and versatile. It is sturdy and well made. It is great for any commercial or residential kitchen. These tongs are comfortable to hold, easy to use and simple to store as they lock up and stay together. Avoid direct food contact with these tongs. I like these and will continue to use but wish I had measured beforehand 7 inches because I really wanted to 9 inches. Luckily I have found ways to use them. I need more of these in my life, I love the silicone ends, I love silicone on my utensils, this is a nicer look and easier to cook with. Perfect size! Excellent for seafood, mussels, clams, salads and appetizers. Its very convenient for those sharing their food especially pasta dishes. The fact that they close makes it easy to store. Great delicate little tongs that I couldn't find a use for until I used them on my nonstick cupcake cooker machine. It allows me to remove the cupcakes from this nonstick surface without scratching the surface or damaging the just baked cupcakes. i will purchase again this 7" Silicone Tip Locking Stainless Steel Utility Tong. I love the silicone tip that makes it so easy to grab and serve salads and finger foods. It's made of very good stainless steel which makes it durable and will last a long time. Cute little tongs! I like that the tips are soft silicone and not hard plastic/silicone. I am less worried about them scratching my pots and pants. Not super helpful if you are dealing with a hot pan as your hand does need to get close due to the short handle, but good for serving. These tongs are great because they have the locking function on them. No need to worry about crowded drawer space when you can snap the lock shut! These are exactly what I needed! I've always preffered tongs that long since they're easier to store. They're a good size, price, and they work very well. The 7" Silicone Tip Locking Stainless Steel Utility Tong met my expectations. They are one of the better tongs that I have purchased. The quality is great as well as the price. Definitely recommend! 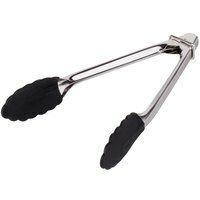 these tongs are so wonderful, and they help to pick up small items in containers, as a garnish, i would wash them well, they smell like factory. 7" Silicone Tip Locking Stainless Steel Utility Tongs are a great addition to your kitchen catering equipment, durable enough to last Through multiple catering events. Perfect for light work, these tong are just a nice tool to keep around. Their size make them perfect to handle -even for kids! - and the silicone part is thick enough for get a good grip. Wanted them to use for service but now, I use them for cooking as well. Maybe not as sturdy as their big 12" brother but they get the job done while being perfect for non-stick pan and pot. A little plus: easy to clean! Silicone tongs came bent and not quite as sturdy as I hoped. I was able to bend them back and the pairs that I have left work fine, but they do break easy. Ordered 3 of these tongs and I am a little disappointed. They are not as sturdy as I would like. They wobble on the hinge when using. I do like the size of them. I bought these when I needed a cheap item and now they're our favorites. It's weird that something so tiny would be so useful, but they're really nicely sized. Used the 7" Silicone Tip Locking Stainless Steel Utility Tong to pick up Saltine crackers. I could pick them up by the tip or in the middle. Very versatile. Great buy. Got these for our salad bar and they were a perfect size. I think I would want to use them for cooing on the stove top, because they are on the smaller size. I love these tongs and have them in two sizes. They lock for storage and they have a good grip. The silicone tips make them great to use with nonstick pans. Great little tongs. Good grip from the silicone tips. Work well for serving from small containers. They also work great for handling small food items on non stick cookware applications. These seem high quality, but they are really quite small. I know it says the size, but just be sure you take note before buying. Will be good for small items in a nonstick pan. Small but very useful silicone utility tong. Love the silicone tip because it doesn't scratch my Teflon pots and pans. It is of sturdy material.